How about those readings today?!? What did you think as we heard each passage? If you came today looking for some easy comfort or light self-help, well… you will be disappointed. Our assigned readings today are as tough as it gets… First is Job’s complaint against a silent God in the midst of tragedy. Then the psalm Jesus quoted on the cross: “My God, my God, why have you forsaken me?” Followed up with Hebrews: “Indeed, the word of God is living and active, sharper than any two-edged sword, piercing until it divides soul from spirit, joints from marrow; it is able to judge the thoughts and intentions of the heart. And before him no creature is hidden, but all are naked and laid bare to the eyes of the one to whom we must render an account.” (4:12-13) And finally the Gospel story about the downfalls of wealth, with Jesus getting seriously blunt: “How hard it will be for those who have wealth to enter the kingdom of God!” Just for fun, let’s have a little poll… based on whatever criteria you choose, which of these readings do you think is the worst? If I’d asked you earlier in the week which one we should just take out altogether, which would you have picked? Job? Psalm? Hebrews? Mark? We’re not going to take it all on today… how could we? But let’s take a few minutes with this most difficult Gospel. If ever there was a Gospel story that we want desperately to be about someone, anyone, other than us, this is it. The primary character is a man who runs up to Jesus and kneels before him with a question: “Good teacher,” he asks, “what must I do to inherit eternal life?” It is no flip question… he asks directly about the heart of salvation. There is no reason to think he doesn’t ask sincerely. Jesus certainly takes his question seriously: “You know the commandments…” he answers, and goes on to list 6 of the big 10… don’t murder, don’t commit adultery, don’t steal, don’t lie, don’t defraud, honour your mother and father. The man is perhaps pleased, maybe relieved, for he has kept all these commandments since his youth. He is a good man. Jesus does not say or otherwise indicate anything else. Jesus, looking at him, loved him… how much we, likely with that man, how much we wish Jesus just left it at that… Jesus loves us… excellent, moving right along. But Jesus speaks again: “You lack one thing;” he responds… gulp… “go, sell what you own, and give the money to the poor, and you will have treasure in heaven; then come, follow me.” As one commentator describes, Jesus “expresses no outrage and makes no denunciations. Rather, he feels love for the man who loves his possessions. 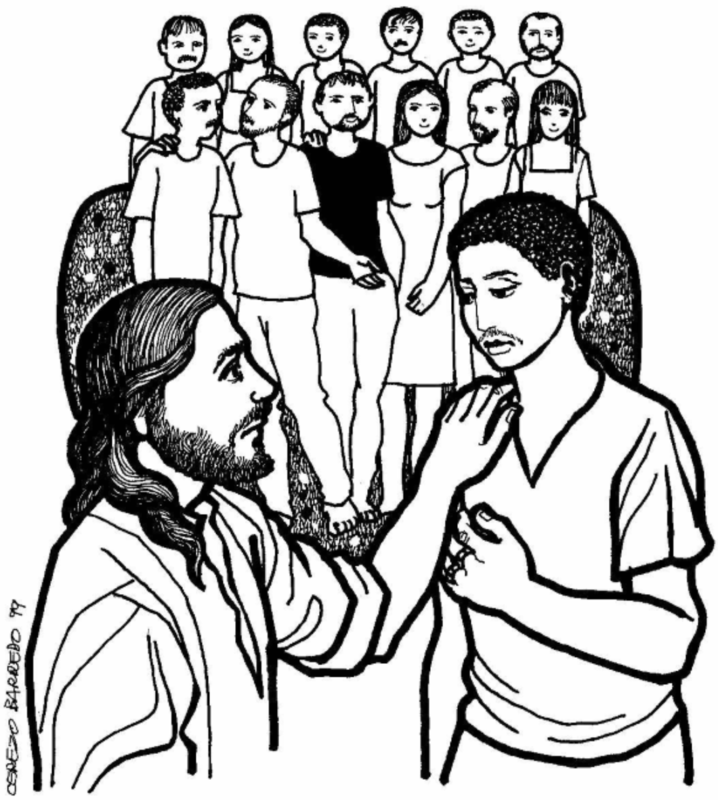 In love, Jesus calls; and in calling, he makes a radical demand.” (Interpretation, 183) “You lack one thing…” Jesus says. It is, of course, the hardest thing. It’s the last thing this good and faithful man wants to let go of for the sake of following. “… sell what you own and give the money to the poor, and you will have treasure in heaven… then come, follow me.” It is a radical demand. It is an impossible command. How does the man react? First shock, then grief, for he had many possessions. Commentators and scholars are no help in softening the blow. They say things like: “The first thing to say about this text, and hopefully not the last thing to say, is that there’s pretty much nothing we can do but manage it. Mark’s is a relentless Gospel, which seems not so much to invite to faith as to prove again and again the impossibility of faith. A few times that pattern is broken… But today’s [passage] is killer. So we have to manage it.” (WP) There are several time-honoured means of management. We can judge the man; make up some flaw that explains, and hopefully explains away, Jesus’ radical demand on that man’s life. He was obsessed with his possessions. He had so much more than he needed. He was stingy. He didn’t give enough. Any explanation is a good explanation. There must have been something about that man’s character that made it so his possessions were a problem for him… something that could never be true for us. Or maybe it’s that he was really rich… like Bill Gates or Mark Zuckerberg. We can easily look to the entertainment or sports industries, around our workplaces, our circle of friends… heck, even this very room… and spot someone richer than we are… it must be a story about them, anybody else… certainly not us. Certainly not me. Anything that makes it so it won’t upset our own comfortable lives. One commentator writes that “… the tension of this radical text resists resolution in any way that removes its pressure on all disciples relative to wealth.” In other words, as disciples of Christ, this story is about every single one of us. The commentator goes on: “After we have done our best to make this text say something less upsetting… Jesus looks intently at us and continues to quietly affirm that life is to be had not by accumulating things, but by disencumbering ourselves.” It is a story about shedding… it is about getting naked. It is a story that strips us bare. In Eastern religions it’s called detachment… that lifelong journey of being engaged with life, but detached from things and outcomes. It’s about freedom. Francis put himself in a very vulnerable position voluntarily, because of love, the love of the God he knew in Christ Jesus. Not everyone who is so vulnerable, who is so poor, is so of their own accord. Indeed, almost all who are desperately poor and vulnerable, and sometimes literally naked, are so because of circumstance… an accident of birth. One of the most common comments first-world people have when reflecting on an experience of a very poor place is how joyful the people are, and how strong and deep their faith seems to be. Surely you have heard someone say: “they have nothing, and yet they have such joy.” We say it in a way that is almost wistful. We want the essence of the faith and joy we witness, but we wouldn’t want to let go of our possessions to get it. For the most part, we would rather have mediocre, but comfortable, lives, surrounded by our things, with the illusion of security. Finally, we might romanticize poverty and those who are poor, by extolling how virtuous they are. By extension, helping them, or fixing the societal structures that create and maintain poverty, would actually be a disservice. We would be taking away their holiness. Whew… that conveniently gets us off the hook. Whatever the case, whatever intellectual gymnastics we need, we tell ourselves that Jesus must be on about something else. Surely Jesus is talking about something more spiritual than money, so that we can keep our material comfort. Like the man in our story today, we are good people. Maybe we haven’t followed *every* commandment since our youth, but basically we do our best to live faithful and generous lives. And mostly, we do pretty well, I think. Jesus looks at us with love too. The challenge of today’s story is to not be so comfortable in Jesus’ loving gaze that we stop listening, and miss His radical demand for more: There is just one think you lack. The good news of this story is in its open ending. The man is shocked and goes away grieving, but we hear nothing else about him. We don’t actually know what he does next. Does he grieve as he follows Jesus’ command and divest himself of his possessions? Does he scoff in his grief at the ridiculousness of the demand? The brilliance of the storytelling is that the ambiguous ending means we can easily put ourselves in the man’s place. It’s a story about us. And the real question is: How will you respond to Jesus’ radical call? Jesus goes on to address his disciples, who are also shocked and perplexed and busy trying to justify themselves. Jesus’ message doesn’t get any easier but his teaching does make clear the primacy of grace: “For mortals it is impossible…” Jesus says, “but not for God; for God all things are possible.” Ultimately, we hear the whole of the Gospel in this story… life and acquisition, suffering and loss, the surprise of grace. Ultimately, we can’t earn our salvation. Jesus calls us to follow; he makes the most radical of demands on our lives, and God acts with grace. We can’t do it on our own, but for God all things are possible.